You may have heard that you should invest as early as possible in order to take advantage of compound interest. The younger you are when you begin investing, the sooner compounding can (possibly) start and the sooner exponential growth can (potentially) happen. The concept of compounding is well worth knowing and relevant to investing. Compound interest is interest received on an initial savings deposit and interest received on interest. At the end of the first year, I receive $50 in interest. However, in subsequent years, I receive an increasing amount of interest, starting with $50.50 at the end of the second year and progressing to $54.68 by the end of the tenth year. The nearly $5 extra in interest is nice but nothing to get super excited about. However, if I could earn 10% annually, then I'd see more impressive results. In this scenario, my investment is credited with $500.00 in the first year and over $1,100.00 in the tenth year. My account balance more than doubles over this time. But with these examples, I'm just getting warmed up. What would happen if I invested $5,000 annually, grew my money at rates of either 5%, 10%, or 15% for 30 years? Let's see how compounding works. 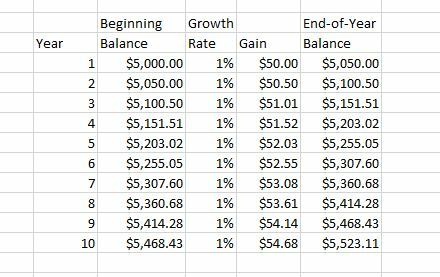 Following along with the spreadsheet, I'll see how a $5,000 annual investment grows if I earn high annual returns, year after year. Here's a recap: If I earn 5% annually, I'll have nearly $350,000 at the end of 30 years; 10%, about $820,000; and 15%, over $2 million. This hypothetical illustration depicts how compound growth works. It also shows how different growth rates yield very different results over long periods of time. 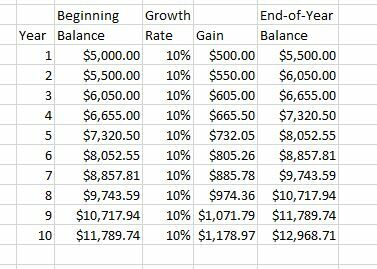 I love designing spreadsheets but there is a way to get a more streamlined projection of compound interest. If I'd rather use regular math to create a compound interest formula, check out Math2.org‘s formulas. Here, I'll find this formula for projecting the future value of a single deposit: Future Value = Initial Deposit x (1 + Interest Rate) to the Power of the Number of Years Invested. So, there are many ways to illustrate compound interest. Under current economic conditions, it's unlikely that I ‘ll earn interest of 10% annually on money I hold in a savings account. Generally, I'll need to take some risk (and risk losing my original deposit, contribution, or investment) to get that rate of growth through investing. Even with smart investing, I may not earn 10% annually. 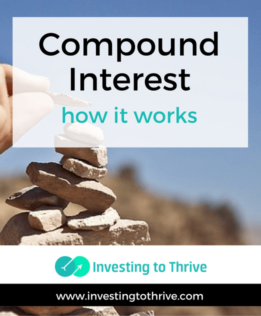 The terms compound interest and compound growth are often used interchangeably but they are not the same. Yes, the compounding effect is the same: the higher the rate and the longer the term, the more compounding takes place. But in the real world, interest on a savings account is typically guaranteed (if FDIC insured) while growth is hoped for but not guaranteed in a stock or bond investment. Simplified retirement calculators may use compound growth rates to determine whether retirement savings will last throughout retirement. Projections are based on compound interest, which may not reflect reality. Still, the idea of compound interest and compound growth is important, even if it can't be measured and projected with precision. Generally, the earlier I invest, the sooner I can earn money on the growth of my investments, not simply earn money on my initial investment. Great article on a basic principle of investing. I usually do it in excel the long way, didn’t know there was a formula. Thanks for the tip. I also liked how you differentiated between compound invest and compound growth. I like using Excel the long way to prove to myself how things work. But I also like the future value functions for a quick calculation. Thanks for reading!